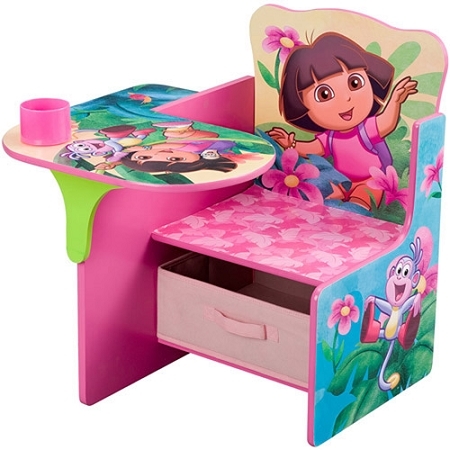 The Dora the Explorer Desk and Chair is the perfect place for your little one to color, write or just sit and imagine. It features an adorable Dora the Explorer theme with bold colors and all your child's favorite characters. This kids' desk and chair comes with a cup holder for her favorite beverage and provides surface space for your child's crayons, toys, and books. It also includes a bin under the seat to offer additional storage space. The bin can be easily pulled out for cleaning and organizing. Equipped with a handle, it also provides easy access to the contents inside. The MDF construction makes this Dora desk and chair with storage bin highly durable. With the included instructions and hardware, this MDF desk and chair is easy to assemble in a short amount of time. Seat Height of Chair: 10.5"